The apparel we purchase is informed and motivated by emotional and quantitative reactions (Fig. 2). We look to price, composition, brand and design to guide us as we make a decision, but what if a new, additional piece of criteria was available? One that evokes both an emotional response and registers on a concise numerical scale, a new reason to buy or not to buy. 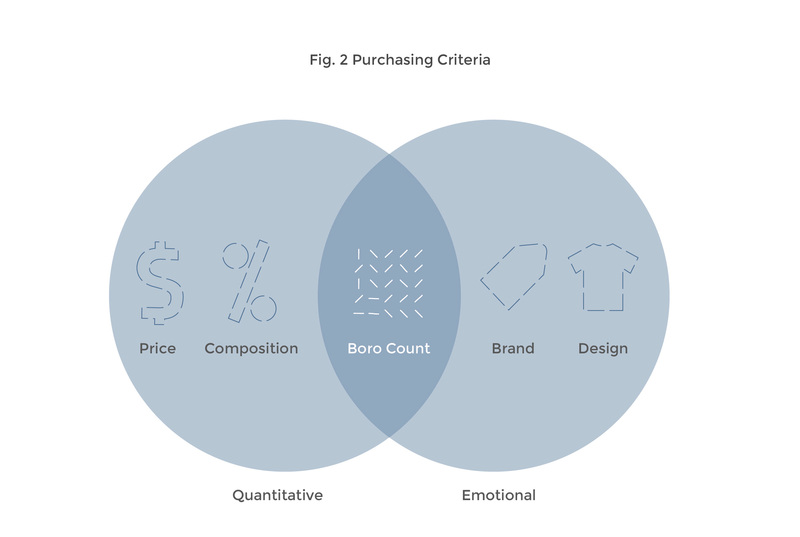 Boro is that new criteria, a smart and open system that takes existing data within the apparel industry and distills it into actionable results for consumers. Boro is a dynamic label system that is designed to educate consumers at the point of sale (Fig. 1). Boro helps consumers make informed purchases regarding a product’s social and ecological sustainability. Relative to other labels, Boro is unique in it’s approach to deliver a dynamic live score for a product based on live data and constantly evolving standards. Moreover, Boro extends past the time of purchase and guides consumers through the rest of the product life cycle to a renewed resource. The name Boro draws from the Japanese method of mending clothes dating back to the 17th century. Born from the utility of the poor working class of the period, the boro method was inspired by the mottainai philosophy: “a feeling of regret or sorrow when something is wasted”. Today, with the wide range of global issues facing our society and environment, the spirit of mottainai is as important as it has ever been. The boro method is characterized by the laboriously patching together of small or torn pieces of fabric. Individually, these pieces are no more than rags, but when sewn together they create beautifully functional garments. At its core, Boro seeks to patch together data and design to develop a shared understanding of materials and their impact on earth, both socially and environmentally. The implementation of the Boro system relies considerably upon the Sustainable Apparel Coalition (SAC) and its member companies. Founded in 2009 by unlikely partners Walmart and Patagonia, the SAC has grown to be the world's leading body for the realization of ecological and social sustainability in the apparel and textiles industry. 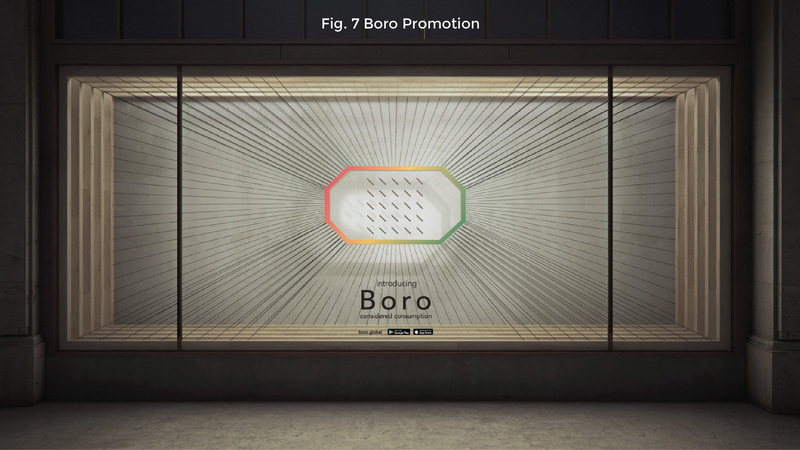 Rather than implementing an entirely new backend for data collection, Boro seeks to populate a score for apparel based on data that is already being recorded by companies and facilities through the creation of the Boro Count (Fig. 3). Along with the immense influence of its conglomerate of members, the SAC has developed data driven tools to educate its member companies and partner facilities. These tools, the brand practices module, the partner facilities practices module, the materials sustainability index developed by Nike and the individual product footprint tool (expected 2017) combine to make up the Higg Index. Already, Nike has begun to add elements to the Higg Index that are more consumer friendly. In 2013 with the help of B&W Environmental and the Royal College of Art, Nike released the Materials Sustainability Index and accompanying Makers App, a guide created for design professionals to make more informed material decisions. Boro builds off this momentum by employing successful scoring methods used in the Higg Index, while expanding the impact of these databases. Boro employs the same peer-to-peer benchmark architecture found in the Higg index and Making App. Just as materials found in the app are scored against other materials and brands evaluate their practices against the aggregate of Higg data, Boro scores products against similar products. The continuity found in widespread use of Higg data collection fields allows Boro to quickly identify anomalies and discrepancies during the validation process. Furthermore, Boro will utilize international trade invoice regulations already in place to cross-reference Higg index entries. This market based approach allows Boro to constantly evolve sustainability standards while sharing the goal with the Higg index to go beyond compliance to inform national and international regulations in the future. Though having these congruences, the scope of Boro does deviate from the Higg index modules and MSI. These existing tools serve only as backend clients that are used internally in the industry and encompass the cradle-to-gate life span of a product. 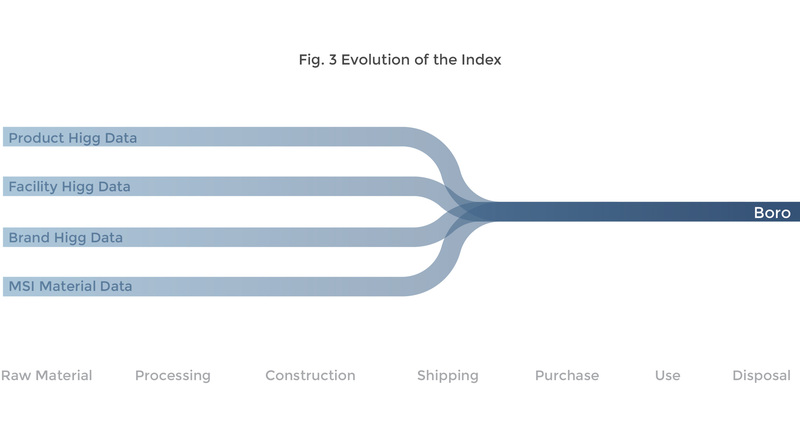 While the Higg index captures data from raw materials to construction, the analysis ends when a product leaves the factory to be shipped for sale. Boro takes this cradle-to-gate data from the Higg index and delivers it to consumers in order to influence the rest of the product lifespan. Boro engages the consumer as an agent of change, beginning with education at the point of purchase and providing them with guidance to be a conscientious owner throughout the rest of the product life span. The Boro team will seek to attend meetings with the SAC to create a tangible label system. This systems includes informative hangtags and permanent cloth tags found inside each participating product. The design of each will contain a dynamic element along with a static score (Fig. 4). The key to the success of the Boro tag is its ability to function at varying levels of a consumer's access to technology. The tag is designed to work with three tiers of technological augmentation: none, limited, and full. At its most basic, the Boro hangtag looks and works as a static hangtag that informs consumers sustainability without the need for any outside technology. 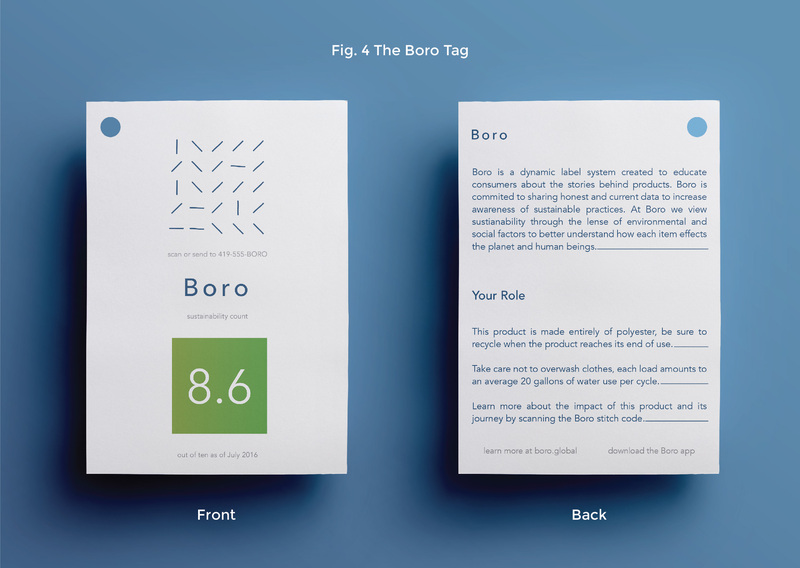 Printed on the tag is the Boro score along with a brief description of the Boro initiative and ways the consumer can be a steward of sustainability. While the value of most hangtags are limited to this printed information, Boro goes beyond to establish a new depth of information. Each Boro tag features a unique stitch code, a matrix of stitch lines that specifically identify the product. With varying degrees of technology found around the world, users can scan the tags with the Boro app or send a picture of the tag to Boro with an SMS message. Boro then identifies the individual product and is able to deliver a deeper analysis to the consumer. The Boro app, a key tool within the Boro system, is accessible through the app store and Boro mobile site (Fig. 5). The lightweight app is designed to be a simple tool for frequent short uses that deliver concise product information in a straightforward manner. 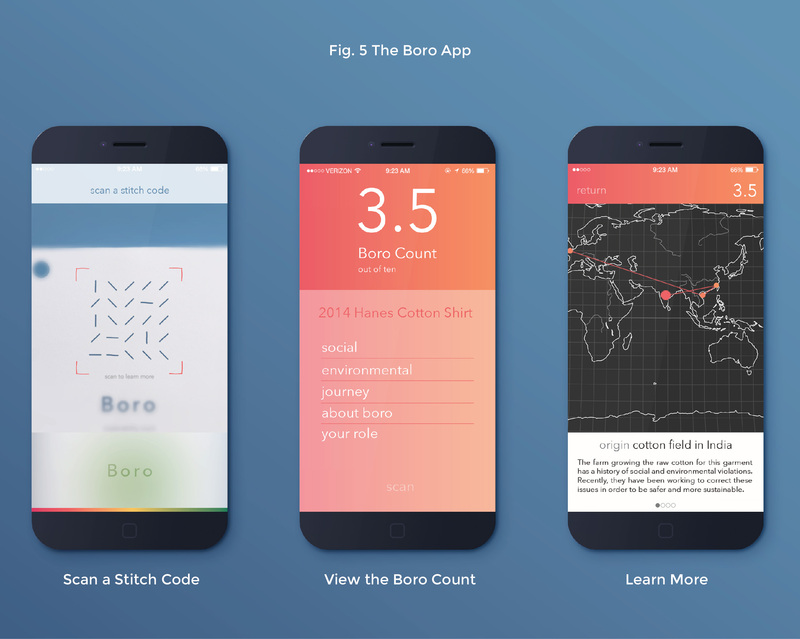 Upon scanning a stitch code with the app, users have access to five key areas of information: social impact, environmental impact, product journey map, about Boro and your role. Because this information is fed from the Higg index, it is constantly evolving in real time. Online purchases are becoming an increasingly significant retail outlet. Intriguingly, online retail also plays a crucial role in brick and mortar purchases. A report by Forrester Research has forecasted that web-influenced offline sales will account for 66% of purchases by the end of 2016. This figure added to the already 20% of direct online sales means a staggering 86% of clothing sales are influenced by the web. Boro seeks to utilize networked purchases by creating a Boro browser widget that integrates into participating Boro online stores. The Boro browser plugin mirrors the experience of the Boro app, without the additional step of scanning the stitch code (Fig. 6). Between the Boro app and online plugin, consumers will have access to the Boro database wherever they may find themselves shopping for products. 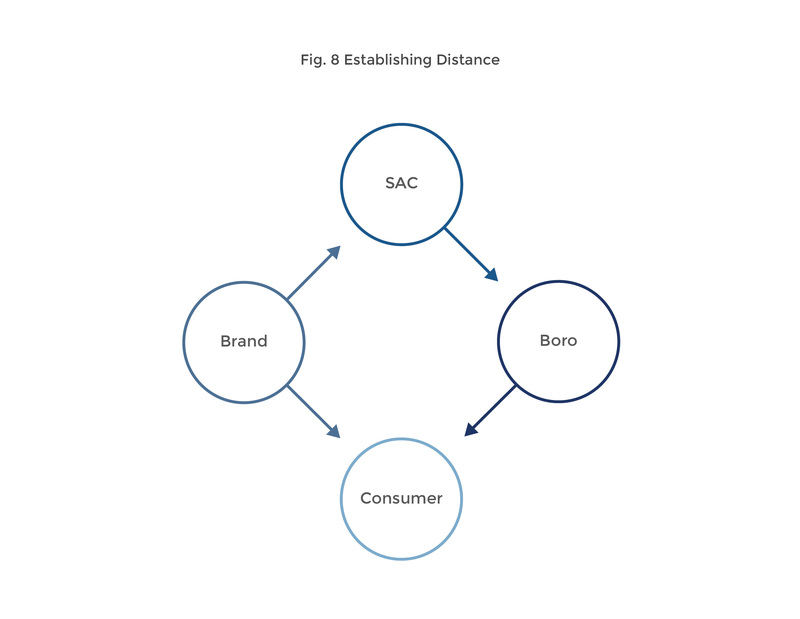 Through SAC member participation, the Boro label system has the opportunity to immediately make a difference in consumer behavior. The clothing industry has rarely acted with the near-universal agreement displayed in the formation of the Sustainable Apparel Coalition. With the SAC using its collective power to set new standards within the industry, the next step is taking this message of sustainable apparel production and making it more easily accessible to the consumer (Fig. 7). Boro seeks to partner with large retailers to promote the implementation and adoption of Boro in the market. To truly make an impact beyond the world largest markets and engage developing nations around the globe, the Boro label system is built to expand beyond the SAC roster into local and regional enterprises. Through collaborations with the United Nations, the Boro group will work to identify rising markets and work with both local apparel producers and retailers to implement the label system. The group will also seek to share the knowledge gained from implementing the dynamic elements of the Boro apparel system with the automotive industry and other commercial markets to bring the general Boro system architecture to industries with a large stake in material production. The Boro Group is a proposed Non-profit governing body of the Boro label system and a subsidiary of the SAC. The Boro group will be tasked with maintaining strong relationships with the SAC and other entities key to the global implementation of the Boro system. The Sustainable Apparel Coalition is a non-profit coalition started by Patagonia and Walmart to promote growth of sustainable practice in the apparel industry. As the proposed primary partner for the Boro label, SAC provides access to member companies and the Higgs index, an aggregated data set developed by Schneider Electric that allows companies to benchmark their practices in sustainability. Nike is a global sportswear company and industry leader in sustainable practices, Nike has demonstrated their commitment to a sustainable future outside of brand marketing through the creation of the MAKING app and sponsorship of the Materials Matter competition. With its advanced supply chain management and the creation of the MSI with B+W Environmental, Nike is uniquely and singularly equipped to pilot the Boro system. MIT Materials Systems Laboratory is key to including supply chain studies in the Boro Count. The MSL would serve as a key entity in implementing a similar system to Boro in the automotive industry. The United Nations followed up the Millennium Development Goals with the 2030 Agenda in September 2015. Goal number 12 on that list reads: Ensure sustainable consumption and production patterns. Supplemented under this goal are points 12.6: Encourage companies, especially large and transnational companies, to adopt sustainable practices and to integrate sustainability information into their reporting cycle and 12.8: By 2030, ensure that people everywhere have the relevant information and awareness for sustainable development and lifestyles in harmony with nature. As these statements make clear, there is a definite opportunity for Boro to work in accordance with the UN to help reach these goals. Underdeveloped Nations often only deal with the beginning and end of a product life cycle. These populations contribute to the harvesting and processing of raw material followed by constructing the products in factories to be shipped to developed nations. Often these nations do not see the products until they come back used or as waste. By educating consumers on the social and environmental factors that define products, the Boro system increases demand for ethically produced garments while reducing the acceptance of unethical sourcing. This will lead to sustainable economies in the future where a factory seamstress can afford to purchase the jacket they are constructing. Developing Nations offer the unique opportunity of a burgeoning consumer culture. It is crucial that sustainable solutions like Boro are available to these markets to ensure their economies are built on a sustainable social, economic, and environmental foundation. This early stage sustainability will eliminate the need for these nations to shift their consumption habits in the manner that developed nations are being forced to do today. Developed Nations offer the opportunity of massive, connected markets essential to the goals of the Boro system. Unfortunately, these developed nations’ pervasive consumer culture is largely uneducated in regards to material use and its effects on the environment and other countries. By meeting people where they shop naturally, at the store, on their phones, and in web shops, Boro seeks to educate and correct the lack of materials knowledge in the apparel sector. The Boro Brand: It is essential that the public views Boro as a trusted mark that represents education and transparency. Other label systems sell their brand badge in association with products and this co-branding practice often leads to puzzled consumers. Establishing Boro as a rating system, not a seal of approval is crucial. The Boro group believes that standards of sustainability should always be evolving; the sustainability standard for a shirt in 2026 will not be the same as the sustainability standard for that shirt in 2016. Distance Between Boro and Participating Companies: Because Boro seeks to implement a self regulating dynamic standard for best practices, it does not involve national or international regulation. Rather than forcing companies to share data, Boro seeks to make this process voluntary and beneficial to participating brands. Because of this policy, Boro is in a position where maintaining third party status apart from the products and companies it is scoring is imperative. This separation exists through the proposed partnership with the Sustainable Apparel Coalition, which will act as the mediator between participating companies and the Boro system (Fig. 8). Data Ownership: The concern of data ownership builds off the issue of establishing distance between Boro and participating brands. Companies submit production data to the system and should be given consumer behavior data as a result. Data from the Boro app will be aggregated for all brands and delivered to the SAC to share with member companies. All data from the ecommerce plugin will be given directly to the brand and forwarded to Boro as well. Month One: Meet with the SAC to present the Boro concept and discuss its joint implementation with the SAC. Brainstorm new approaches to the Boro system with input from SAC leadership. Month Three: Present Boro prototypes and research proposal to SAC member to gauge interest and refine design direction. Month Six: Seek entry into the Second Muse Launch Incubator to connect with developers and statisticians to bring the project to fruition. End of Year One: Working math behind the Boro count and pilot programs for the web app completed with early adopter companies and consumers. User centered design for the Boro app begins. End of Year Two: Finish the second phase of the web plugin. App pilot program for early adopter companies and consumers begins. Medium Term Actions: Boro is a tool help bridge the gaps that will inevitably develop between the linear economy of today and the circular economy of tomorrow. For 2016, Boro is focused on simultaneously educating consumers about issues within our current system while encouraging innovation toward the future. As the consumer population becomes engaged with the origin narrative of their products, Boro will seek to build off this awareness and inspire consumers to return products back into usable resources. Long Term Actions: The long term goals of Boro are twofold. The first goal is to become a ubiquitous piece of criteria when shopping for apparel. The second long term goal is to implement and spread knowledge of future standards. As humans continue to explore new applications for connected data, rethinking education will increase in importance. Boro, along with already successful label systems, is about educating consumers. This pursuit is perpetual, and in 50 years the best solution to reaching the consumer base may very well be indistinguishable from this 2016 vision (Fig. 9). Good Guide is a sustainable label system owned by the Underwriters Laboratory focused on rating consumer goods in the household space. Good Guide allows brands to pay for advertisement and promotion on their services (this payment does not influence the rating of a product). Nike Making App was developed by Nike with help from B&W Environmental and the Centre for Sustainable Fashion as tool for designers. 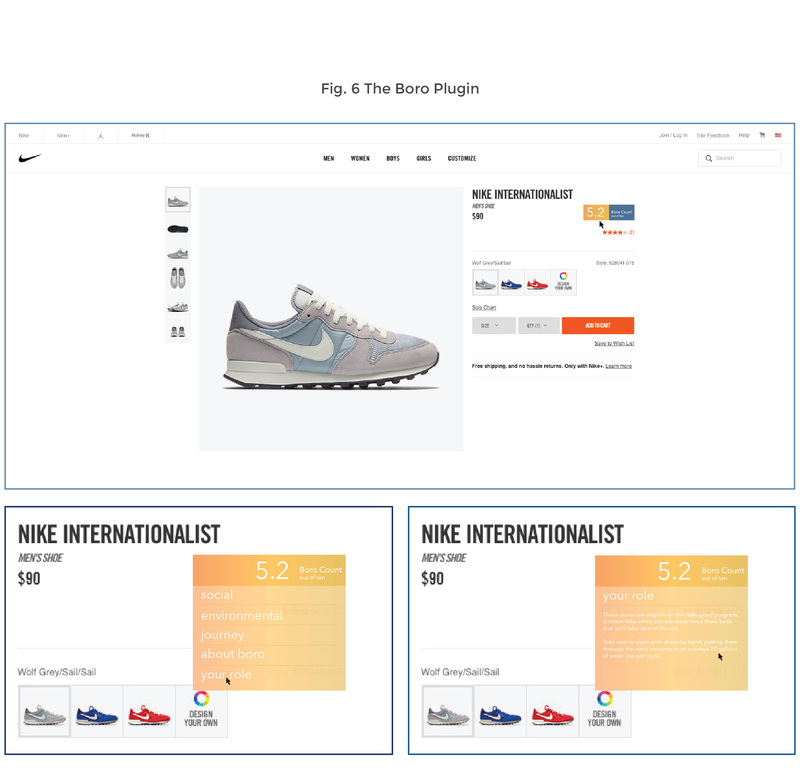 Just as the Higg index was created as a tool for producers in the industry and Nike led the Making app as a tool for creators, Boro seeks to become the tool to educate consumers globally. Rapanui is a sustainably oriented brand that has developed its own product tracking and eco label system. While the Rapanui system is well considered, the label exists solely as a standard for Rapanui products. MAKERS Eco Tag by zlock19 is a proposal for a static printed tag with an app to give financial incentives and keep track of user’s purchases.